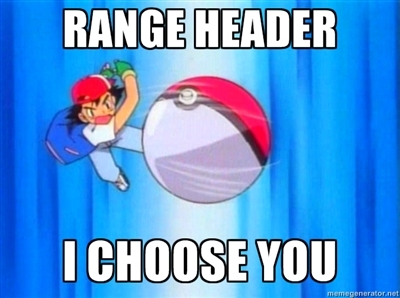 Range header, I choose you (for pagination)! I was looking around for a semantic way to do pagination over HTTP recently. I had previously used the OData-style $skip and $top query string parameters and I was just generally dissatisfied with how that turned out. So, I was searching for alternatives. I happened upon a question on Stack Overflow that discussed using the Range HTTP header for pagination purposes. The conclusion there was to use a different approach (mimicking Atom), but I disagree. I feel that the Range header is a perfect fit for pagination. Why is the Range header a good fit? The Range header is normally used by browsers to request specific byte-ranges of binary files. It powers the pause-and-resume functionality of almost every download manager in existence. This fact tempted me to simply conclude that usage of the Range header for any purpose other than pause-and-resume would be an abuse. HTTP retrieval requests using conditional or unconditional GET methods MAY request one or more sub-ranges of the entity, instead of the entire entity, using the Range request header, which applies to the entity returned as the result of the request. Our entity is a collection of objects, and we are requesting "sub-ranges of the entity, instead of the entire entity." This is a perfect fit. So, from the spec, it looks like the Range header was designed to handle this concern, but how does this play out in practice? It would be foolish to just commit to using the header without making sure it was up to the task. Let's evaluate its behavior in contrast to OData-style pagination. These examples contain partial HTTP requests. Common elements between the OData and Ranger header styles have been factored out. These include the http version; the Host, Accept, Content-Type, and Content-Length headers; and the data itself. Querying the root of the collection. Both of these have defaults for what the user is allowed to request (limited to 10), but the Range header style is allowed to send back the count, without $inlinecount being specified. The Accept-Ranges header signals that the users range is accepted and implies that a Content-Ranges may be present. This makes for good discoverability. Importantly, the response code for the Range header style is 200 (rather than 206 as you might expect) because the request did not include the Range header itself. Accept-Ranges and Content-Range headers are still allowed in the response, keeping it semantically correct. The OData-style, in contrast, will not automatically include the count of the collection in the response. Even if this response were to include the count, unsolicited, there is still no easy way to discover how this data is sent. Pulling the first page of results normally. Since the request included the Range header, the server is allowed to respond with a 206 Partial Content status code, indicating the presence of the Content-Range response header. OData had to specify the $inlinecount=allpages parameter in order to get the full length of the filtered collection, bloating the URL. This indicates that the full count is not included, possibly because it is too expensive to calculate. This is often the case for complex queries. This flexibility allows the server to chose whether or not to calculate the total length, based on the particular query at hand. In the OData version, however, the $inlinecount parameter is a command to get the count. The server is not free to withold the count when it is expensive or difficult to obtain. Pulling subsequent pages of data. Both systems perform roughly the same for pages in the middle of the collection. Neither system has anything to offer here, nor does either fail in any special way. Requesting past the end of the collection. Notice that the unbounded range mimics the semantics of the OData-style request. Note, as well, that byte-ranges are specified here as a single use-case of the range header, firmly implying that the usage as shown here is the correct semantic usage. The OData-style is not allowed to return a 416 status code, because it never sent a Range header. One could argue, however, that this status code is semantically correct, even for the OData style request. Additional functionality of the range header. Here are some things that the Range header supports that have no analog in the OData-style. The Range header style allows for discovery of acceptable ranges via the OPTIONS HTTP verb. The Range header style allows for requests rooted at the end of the entity, rather than the begining. The Range header style allows for requests that specify multiple ranges; HTTP supports sending results back as a multipart document. The If-Range header allows a range of the entity to be downloaded if it has not changed, but download the entire entity if it has changed. These semantics don't really fit the pagination model very well, since it is pretty much aimed at resuming paused downloads. As mentioned earlier, the Content-Range response header can specify * as the total size of the entity. This means that the entity has an unknown or unbounded size. This is particularly useful in search applications that may not know the full size of the result set for every query. To me, it seems that the Range header is both more powerful and more semantically correct than the OData-style of query string parameters (or any query string style, for that matter). As such, I will always use the standard Range HTTP header whenever I implement REST APIs.